Josephine Creek might be regarded as Oregon’s equivalent of the Sutter’s Mill gold discovery that launched the 1849 California gold rush. Illinois River in the foreground with Josephine Creek canyon and its headwaters at the snow capped Josephine Mountain in the right background. At the foot of Josephine Mountain, Canyon Creek goes to the right and Josephine Creek continues to the left. The search for gold in Oregon reaches back to the first immigrants coming into this state in the 1840s. These searches were all small scale panning at places where gold prospecting looked promising to people traveling through the country. Gold was discovered during those years but not in large enough quantity to yield an economic return that was worth more than the work to get it (2, 8, 9). None of these gold discoveries sparked a large-scale and rapid movement of prospectors into Oregon. This would change with a discovery of gold on Josephine Creek in 1851. The Josephine Creek discovery was made at a time when news only traveled as fast as a person could walk or ride on a horse to the nearest settlement. There were no newspapers in the immediate region to chronicle discovery events as they happened and most who heard about the strike didn’t take time to write about it, likely because they were too busy packing and traveling to stake a claim and make their fortune. Most of what is known about Josephine Creek and its importance in Oregon history comes from memoirs written by the people who were directly involved. The Illinois Valley Indians at that time being troublesome, it was necessary to build a fort for protection, and consequently a fort was built of logs on Josephine Creek and called Fort Gidney. It was so named after one of the miners in the group, Nat Giles, whose nickname was Gidney. As soon as the fort was completed, it was necessary to go out for provisions. It was agreed that lots should be drawn to see who should make the trip. It fell to the lots of Luther Hasbrouck, Mose Dusenberry, Henry Lawrence and Captain Jennings. They went north [probably following the same route as Highway 199] until they found a trail from Oregon to California, which they followed to Shasta City. There they purchased supplies and returned in twenty-one days. The party supposed they had independent ‘diggings’ on Josephine Creek, but on their return, they found a mining town of tents. Probably 2000 people were in Illinois Valley, The prospectors had been followed to their new camp and as soon as the discovery had been made, news was sent to California of the new Eldorado. This caused a great rush to Oregon and for this time on, Southern Oregon was alive with busy placer miners (2). Four of the prospectors who discovered gold on Josephine Creek were from Illinois and were the ones who named the Illinois Valley and Illinois River. The date of the discovery cited in historic accounts varies from early May to early August of 1851 (5, 7). The date often cited in recent literature is May 2, 1851. Prospectors began a rapid rush into southern Oregon and new discoveries of gold were made. One of these that gained significant notoriety, at least from a gold rush perspective, was the discovery of gold on Jackson Creek in December 1851. The Jackson Creek discovery has been identified in recent literature as the place where the Oregon gold rush began but it needs to be taken into account that there was no reliable documentation of how many prospectors were coming into the region and where they were going. This was a time of confusion caused by increasing conflicts with local Native Americans and the influx of newcomers with little knowledge of the area who may have been traveling to the gold rush that was already underway in Illinois Valley and changed their destination to Jackson Creek when they heard about the discovery. We have received intelligence that an encounter was had with the Rogue River Indians by a detachment of 30 U.S. troops, on the 18th of June, in Rogue River Valley, near Table Rock. It is said that there are more than 1000 warriors there who are hostile. Five hundred volunteers are expected from the mines to fight them (12). 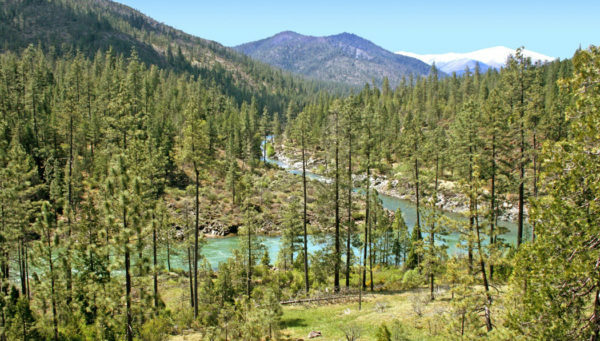 In June of 1851, the only mines in southern Oregon were on Josephine Creek so this is the most likely place that miners would have come from although Yreka is another possibility. Prospectors continued to go Josephine and Canyon creeks in the fall of 1851, which included “….a number of Willamette valley farmers and others who tried their fortunes on the two creeks, but with indifferent success, owing mainly to their lack of skill and almost total lack of mining tools (6).” This is likely when Josephine Rollins came to Illinois Valley with her parents. When the Jackson Creek discovery was made it would be logical that the majority of prospectors coming into the region would head to Jacksonville because it was a new strike and offered a greater opportunity for newcomers to get a good claim. This may have given the impression to people who were not aware of the mining already underway in Illinois Valley that the gold rush was started by the Jackson Creek discovery. Soon after the Jackson Creek discovery, the attention turned back to Illinois Valley in early 1852 with discoveries of gold at Sailor Diggings and Althouse Creek in Illinois Valley. Althouse Creek had a significant and relatively uniform yield of gold over a span of ten miles and that place quickly assumed an importance equal to that of Jacksonville. The pay dirt on this stream in places was of the richest description and probably surpassed any other locality in the whole of Southern Oregon (6). 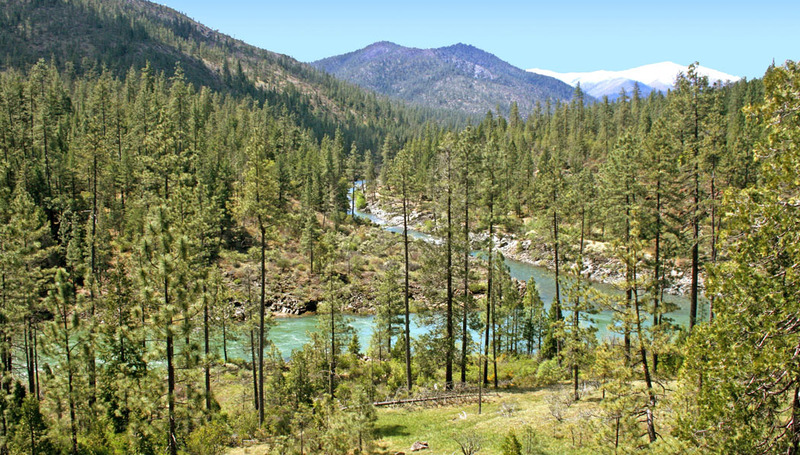 Althouse Creek is the location where the largest gold nugget in Oregon history was found. The “Sailor Diggings” discovery, also made in early 1852 (14), led to the establishment of the town of Waldo, the first county seat of Josephine County when the county was established in 1856. .
By the end of 1852 the multiple discoveries of gold in this region must have attracted a large number of prospectors who depended on supplies brought in on pack trains from the coastal town of Trinidad, California. Unfortunately, an unusually large amount of deep snowfall fell that winter and completely cut off supplies coming into this region (6). There was no documentation on how many prospectors may have perished (5). Josephine is a mining county, and has had all the vicissitudes of such a county. Her citizens leading a roving life, and having little to bind them to the soil mostly left during the Indian war in 1855-1856 (1: p97). The second was the Frazer River gold discovery in Canada. In 1857 and 1858 there took place that remarkable mining craze, the Frazer river excitement, which has become typical of all its kind. It was directly responsible for a great falling off in the population of Josephine county (6). Perhaps above all Josephine County has the inherent vice of all mining communities, that for every dollar taken from her mineral deposits she is one dollar poorer. There is no accumulation; there is no heaping up by one generation for the generation which is to follow (1: p98). From Cave Junction, drive five miles north and turn left on Eight Dollar Mountain Road. The intersection is located next to mile marker 24. Follow Eight Dollar Mountain Road for three miles to the bridge over Illinois River. Cross the bridge and drive another half mile to the Josephine Creek Campground on the left. Walk through the campground following a two track road toward Jospehine Creek. This road gets steep with loose rock. Be certain to wear sturdy shoes. 4) Spreen, Christian August, 1939. 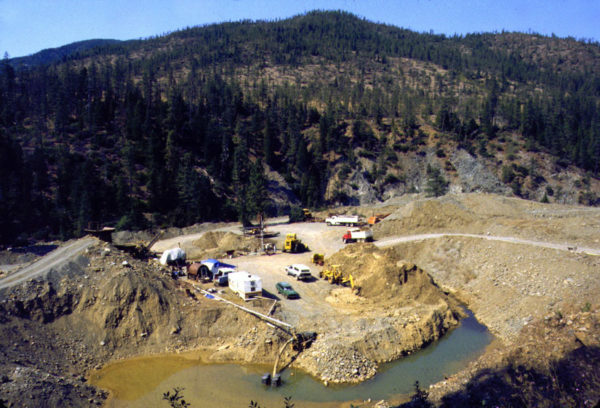 A History of Placer Gold Mining in Oregon, 1850-1870. M.A. Thesis, University of Oregon, 1939. 5) Stovall, Dennis H, 1904. The Pioneer Days of Southern Oregon. Mineral Wealth, August 1, 1904, Redding, California. 10) Ramp, Len, 1960. Oregon’s Mining Began in County; Potential Good. Daily Courier, April 7, 1960, p5. A mining operation in the upper part of the Josephine Creek watershed was active in 1999 when this photo was taken.